ABU DHABI, 10th September, 2018 (WAM) -- His Highness Sheikh Mohamed bin Zayed Al Nahyan, Crown Prince of Abu Dhabi and Deputy Supreme Commander of the UAE Armed Forces, received, with the attendance of His Majesty King Mohammed VI, King of Morocco, and H.H. Sheikh Humaid bin Rashid Al Nuaimi, Supreme Council Member and Ruler of Ajman, the student, Mohammed Saif Al Mazrouei, who won the "Wharton Global Young Leaders Academy Work Plan Competition," which was held at the University of Pennsylvania in the United States, US, with the participation of nine students from the UAE and hundreds of students from various countries around the world. 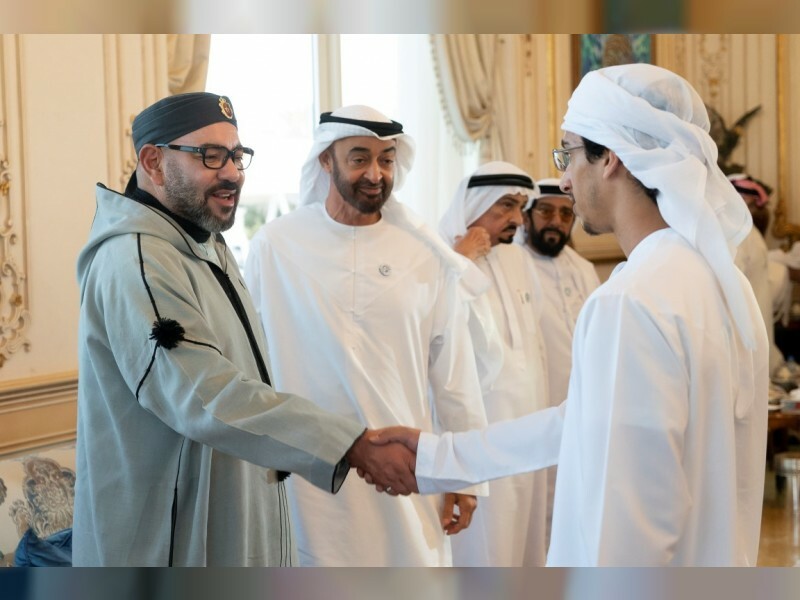 His Highness Sheikh Mohamed bin Zayed, His Majesty King Mohammed VI and Sheikh Humaid congratulated Al Mazrouei while wishing him luck and success and urging him to continue to hard work and achieve further accomplishments. Present were H.H. Sheikh Ammar bin Humaid Al Nuaimi, Crown Prince of Ajman; H.H. Sheikh Tahnoun bin Mohammed Al Nahyan, Abu Dhabi Ruler's Representative in Al Ain Region; H.H. Sheikh Saif bin Mohammed Al Nahyan; H.H. Sheikh Hazza bin Zayed Al Nahyan, Deputy Chairman of Abu Dhabi Executive Council; H.H. Sheikh Nahyan bin Zayed Al Nahyan, Chairman of the Board of Trustees of Zayed bin Sultan Al Nahyan Charitable and Humanitarian Foundation; H.H. Lt. General Sheikh Saif bin Zayed Al Nahyan, Deputy Prime Minister and Minister of the Interior; H.H. Sheikh Mansour bin Zayed Al Nahyan, Deputy Prime Minister and Minister of Presidential Affairs; H.H. Sheikh Hamed bin Zayed Al Nahyan, Chief of the Abu Dhabi Crown Prince's Court; H.H. Sheikh Abdullah bin Zayed Al Nahyan, Minister of Foreign Affairs and International Cooperation; H.H. Sheikh Khalid bin Zayed Al Nahyan Chairman of the Board of Zayed Higher Organisation for Humanitarian Care & Special Needs (ZHO); H.H. Sheikh Khalid bin Mohamed bin Zayed Al Nahyan and H.H. Sheikh Theyab bin Mohamed bin Zayed Al Nahyan. Chairman of the Abu Dhabi Department of Transport. Al Mazrouei’s participation in the competition is part of the "Stars of the Medical Future Programme" organised by the Al Bayt Mitwahid Association, in cooperation with VPS Healthcare. The students participated in a series of qualifying workshops, which covered the principles of entrepreneurship, market research and accounting.